The parish seat of Claiborne Parish is Homer, which is where the Clerk of Courts office is located, at 512 East Main. Their phone number is 318-927-9601, and they have a Contact Us form on their website where inquiries regarding vital records, marriage licenses, etc., can be sent directly to the Clerk's office. The parish's main website also links to the USGenWeb Project, an online indexing system, which has a small number of birth and marriage records available for viewing for free. Claiborne Parish, which borders Arkansas on the northern border of Louisiana, was named after the very first governor of the state, William C. C. Claiborne. 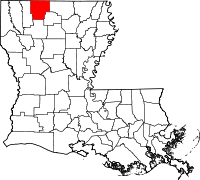 The parish only has two towns, Haynesville and Homer, the latter being the largest of the two, and three villages, Athens, Lisbon, and Junction City, and the overall population is under 17,000. It was founded in 1828.